All the people below were matriculated as apothecaries by the University (except for John Eykyn, who was apprenticed to a matriculated apothecary). They were matriculated under various titles: Pharmacopola, Apothecary, Alchymista, Druggist, Chemist, and Chemicus. Some of the apothecaries listed below also styled themselves “surgeon”; and conversely, some of the privileged surgeons also acted as apothecaries. Described as “Pharmacopola” on inscription in St Mary the Virgin. Son of London merchant of same name, apprenticed to Daniel Bennett (above) in January 1800. He and his wife Mary baptised their daughter Elizabeth at St Martin’s Church in December 1815. Listed in Pigot’s Directory for 1823/4 and for 1830 as a Chemist and Druggist in St Aldate’s. Matriculated as “Apothecarius et parturientibus opem ferrens” (apothecary and someone who aids women in labour) on 26 June 1821. Although not matriculated as a Surgeon, but listed as a surgeon and apothecary at 48 High Street in directories from 1823 to 1850+. Matriculated as “apothecary” on 21 May 1778 and listed as such in the Universal Business Directory of 1794/5. Listed as a surgeon in Broad Street in Pigot’s Directory of 1823/4 and 1830. Stockley is described as a university apothecary (deceased) when his son William is apprenticed to a joiner in 1727. Matriculated as “Pharmacopola” on 25 April 1805 but listed as Surgeon in Pigot’s Directory of 1830. Matriculated as “Pharmacopola” on 14 July 1808, but listed as a Surgeon and Apothecary in Pigot’s Directory for 1823/4. 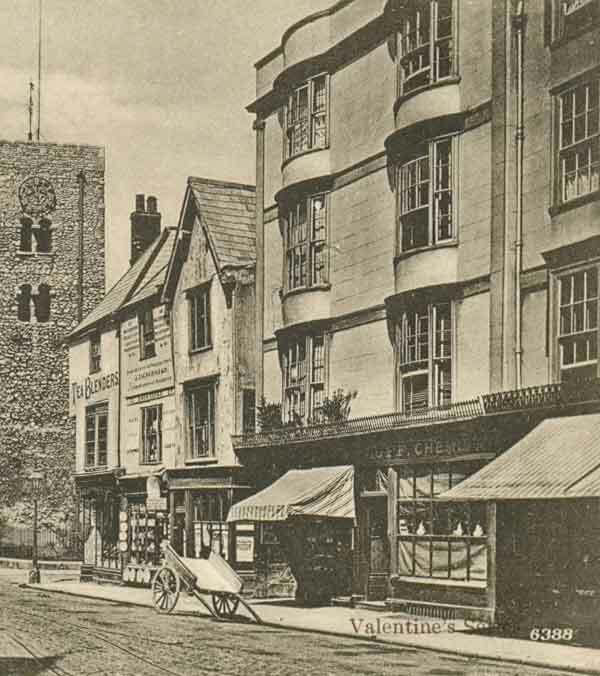 Listed as an Oxford “Chemist & Druggist” in the High Street in Pigot’s Directory for 1830, and at 79 High Street in Robson’s Commercial Directory for 1839 and Pigot’s Directory for 1842. 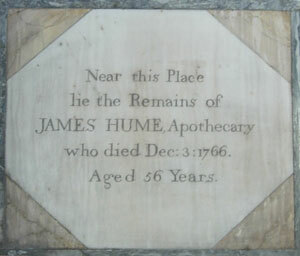 Above: A plaque on the wall reads: “Near this Place lie the Remains of JAMES HUME, Apothecary who died Dec: 3: 1766. 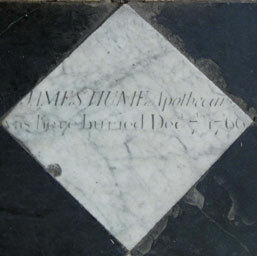 Age 56 Years”, while a diamond tile on the floor reads “JAMES HUME Apothecary was here buried Dec 7 1760”.